The first bicycles were of wooden construction, from their frame to their wheels and later moved from wooden to iron elements. Bicycles evolved during the late 19th century and, by 1900, elements of modern bicycles had emerged. In the early 1900s, upgrades to bicycles during the “Safety Era” made them more sturdy, safe, and reliable modes of transportation with improvements to the seats, brakes, tires, and wheel spokes. Bicycles offered an option for exercise and faster transport than walking. They represented freedom for women, even as conservatives feared they would lead to female corruption. 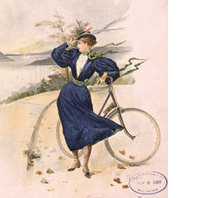 Women pushed past the controversy to enjoy bicycles in all types and sizes, even joining clubs and participating in contests. The bicycle has stood the test of time as a healthy and fun mode of transportation. Note: there is the possible addition of reproduction and antique bicycles with this exhibit. These cycles are in the collections of the North Carolina Transportation Museum. If you would like to investigate borrowing the cycles on loan for the duration of the exhibit at your location, please contact North Carolina Transportation Museum staff, James Hart, Exhibits Designer, 704-636-2889, ext. 256, james.hart@ncdcr.gov or LeAnne Johnson, Collections Manager, kathryn.l.johnson@ncdcr.gov, 704-636-2889 ext. 230.